You can be assured of a high standard of accommodation, wherever you choose to stay during your golf tour in Scotland. All of the accommodation we feature in our tours has been personally selected to ensure you enjoy the standard of accommodation and levels of service you expect. To find out more about the accommodation we recommend in each region, choose from the list on the right, or use the map to highlight the area of interest to you. 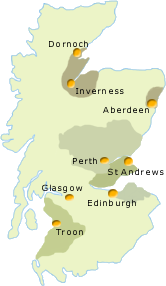 We are able to offer a range of accommodation in each of the regions of Scotland we cover. Choose from friendly bed and breakfasts and guest houses where a warm welcome awaits to country houses and five star resort hotels. Amongst the luxury options we recommend are the Old Course Hotel at St Andrews and The Gleneagles Hotel. You can select exactly the type of accommodation that you prefer. If the grade you would prefer for your golf tour is not illustrated then please contact us with your requirements and we will be happy to provide you with information on alternatives. Please note - Smoking is illegal in all enclosed public spaces in Scotland, which covers pubs, restaurants, hotels and golf clubs. Hotels have the option of offering bedrooms designated for smoking, but many are completely smoke free.